Plant in full sun, says the label on the plant. To me, a plant that lives in full sun should be able to cope with up to nine hours of direct sunlight each day. This means that they are usually woody shrubs (like Rosemary, Lavender), trees (stone fruit, citrus), or succulent leaved plants – they are tougher and better able to cope with the stress of heat that comes with sun. Softer plants, like many vegetables and herbs, are better off in a bright position, where they get around five to six hours of sun per day. This is still called full sun, though I think we need to call this “sunny” not “full sun”. Unfortunately a lot of the gardening resources we have here in Australia have been adapted from British publications. Changing the Spring season from March to September, and referring to Zucchinis instead of Courgettes is not enough though. Southern Australia has significantly more sunlight hours than our friends in Europe, with far higher temperatures too. Even the hottest Summer day in the UK would barely get above 32 degrees, that is 10 degrees less than gardeners in Southern Australia will experience. Culinary herbs like Coriander, Basil, Parsley and Tarragon can actually grow well in a bright position, where the only direct sunshine on their leaves is for an hour or two in the morning. So if you have a spot outside where you have enough light to read, this will be bright enough for your plants in Summer. Tomatoes, Eggplant, Capsicums, Silverbeet and Zucchini are some of the vegetables that will grow happily in a sunny position, receiving around six hours of sunshine per day. On days of extreme heat temporary shade can be built around the vegetable garden – you can read more about that here – to reduce the stress on your plants, and keep them producing through a heatwave. As your garden develops you may want to consider having a garden bed that receives late afternoon shade in Summer, reducing the amount of sunshine and heat going onto the garden from say 3pm onwards. A garden bed for Winter vegetables should receive plenty of sun, so should be positioned clear of shadows from buildings and trees, and be aligned north to south for maximum rays. What have you learnt about your own garden by using different sun zones for your crop? Hi Alice, awesome post. 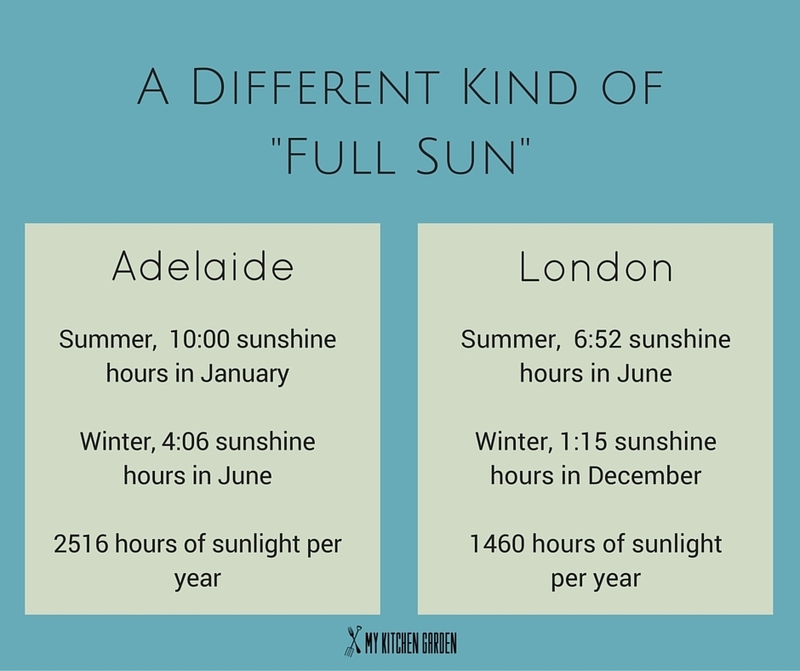 It echoes what I’ve noticed about what “full sun” means in Australia, too. Here in Perth we have a similar climate to yours. Thanks for the tips.